This Moss Stitch Jacket is featured in the Debbie Bliss Fall/Winter 2009 magazine. 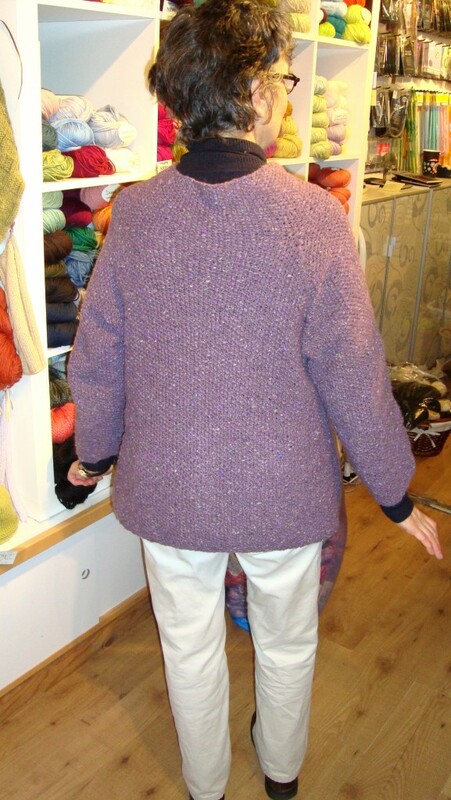 The pattern uses Debbie Bliss Donegal Luxury Tweed Aran – a gorgeous, soft tweed. 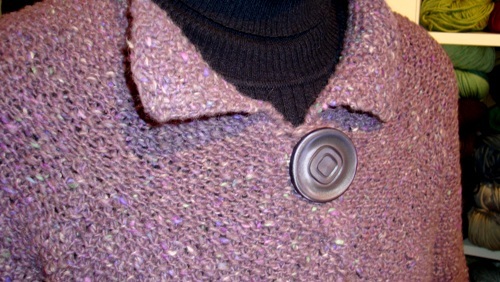 I think the button that Linda chose is a perfect finishing touch to the jacket! 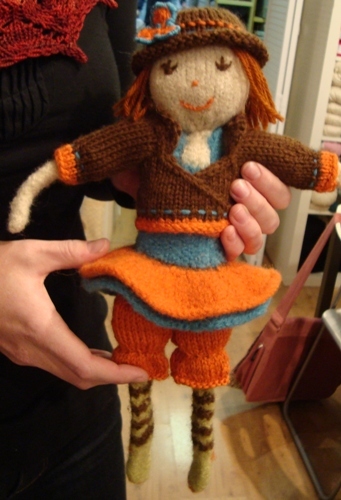 Flora is the cutest little doll made from a kit by Pick Up Sticks. Linda said she was really fun to make! If you love Flora, make sure you get her gear! 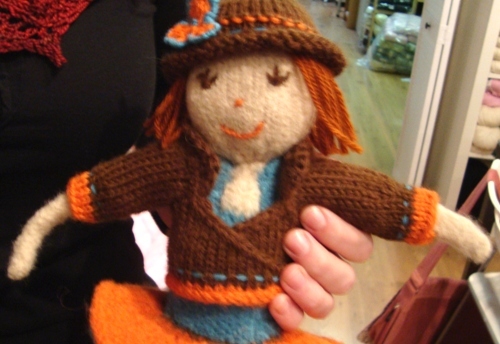 Floras Furnishings comes with everything she’ll need for an outing; a hat, sweater, bloomers, and a knitting bag with needles. Ok, so I may be a little biased about this next one because of my love for bunnies, but isn’t he so cute!? 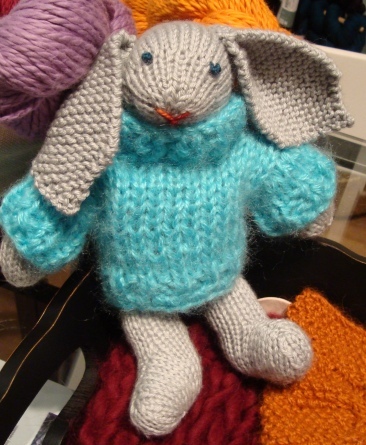 Linda made this adorable bunny from the Debbie Bliss Spring Summer ’09 magazine. The bunny takes 2 balls of Debbie Bliss Rialto Dk and is knit on 3.25mm needles. 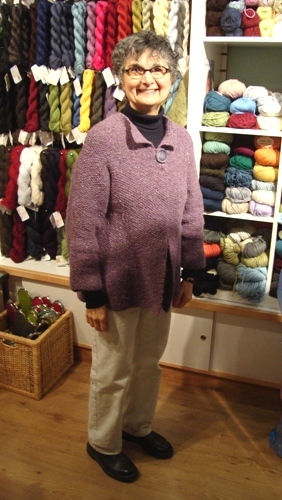 The pattern suggests Debbie Bliss Donegal Aran Tweed for the sweater, but Linda used something from her yarn stash as you don’t need too much yardage. Thanks so much for all the inspiration Linda… that bunny is certainly on my “to-do” list! This week’s special is Mission Falls 1824 Cotton at 25% off. Why not knit up some of these little baby hats. You can find the pattern in Last Minute Knitted Gifts and it only uses one ball per hat! This sale yarn is only available at the Point Grey location, but can easily be transferred to Edgemont. This entry was posted on Friday, March 12th, 2010 at 12:25 pm	and is filed under Uncategorized. You can follow any responses to this entry through the RSS 2.0 feed. Both comments and pings are currently closed. Oooh what a gorgeous sweater! What delicious colour. You did a beautiful job. A great little hat. I’ve made it a couple of times.